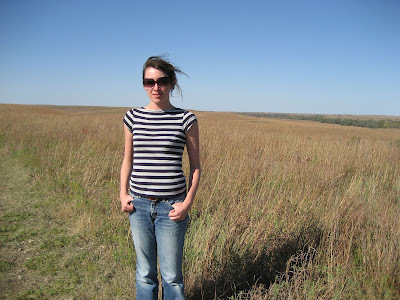 Megan Kaminski is the author of one book of poetry, Desiring Map (Coconut Books 2012), and six chapbooks, including most recently favored daughter (Dancing Girl Press 2012) and collection (Dusie, 2011). She teaches creative writing and literature at the University of Kansas and also curates the Taproom Poetry Series in downtown Lawrence, KS. Wow, my first book, Desiring Map, just came out, so I am not exactly sure how it will change my life. I can tell you that I am writing this response from California, where I am on my first book tour, and I am so enjoying getting out and sharing my poems with people. It is nice to have a physical manifestation of all of the work that I have put into these poems—they were about seven years in the making. I didn't start writing any kind of creative work until I was in my second year of college. I'd always been a voracious reader, but I never really imagined being able to write anything worth reading. The city/expanse of suburbs where I grew up wasn't really much of a cultural center, so for me growing up, it seemed like poetry was just something that existed in books written a long time ago by sophisticated and erudite people. It wasn't until I started college that I realized that there were actually living, breathing poets who wrote things. One day, after a particularly heated discussion of Emily Dickinson's poetry in my college English class, my professor pulled me aside after class and suggested that I register for a creative writing class in poetry. For some reason she assumed that I wrote poetry with some regularity, and that was the first time I had ever had someone take a real interest in my academic work and I was so flattered by that, so I just went along with it and registered for my first poetry workshop where I wrote my first poem. I loved that class and I've been writing poetry ever since. I consider my writing as a way of thinking about the world. So I typically start with something I am thinking about and let my reflections and research guide my writing. I take a lot of time reading and exploring before I really get into the writing. Pretty soon, some sort of interesting problem starts to emerge from the poems and I try to follow that problem, exploring various possibilities and continuing to seek out other texts that might inform my approach. For me writing is a slow and perhaps somewhat indulgent process. I love to live in the ideas and research. I take a million notes, most of which have little to do with the poems. I like to think of the poems I write as part of a larger intellectual/creative project. The poems that get sent out into the world at the end are really a small document of the thinking I've been engaged in. I also try to produce research—whether in the form of papers, or presentations, or book reviews—as a way of forcing myself to think deeply and rigorously about the issues at hand. I like to let language guide me. Once I start seeing patterns emerge—stylistically and/or thematically—I start to look at the poems more closely and figure out what it is that I keep coming back to, what it is that I am trying to work out in those poems. When I get an inkling of that I start to explore with a little more purpose—do some research and start thinking about what a larger project might look like—but mainly I like to let it be constantly evolving process. Sometimes a set of poems fails to spur further thoughts and they just end as a short series, but sometimes they evolve into a chapbook or book-length project. I love reading my work in public. My writing process is so solitary most of the time—I occasionally send poems to friends through email, but mostly I am the only person who sees poems while they are in progress—so I really enjoy the times that get to share my work with people. I used to be mortified by the idea of reading in public, but I've finally in these last few years become comfortable with my own voice. Yes, definitely. I think the concerns change for me typically on a project-by-project basis, but there are some things that always seem to emerge: how we live in space and the world, the body in public and private space, questions of subjectivity/subject-hood, gender, economics, ecology. Well, I'm interested in Shelley's claim that poets are the "unacknowledged legislators of the world." I think that this is a bit optimistic—and I think that poetry is not equivalent to or a substitute for direct action—but I do think that poets have the opportunity to shape the way that we look at the world, or help us look at it anew, whether they write poems with overtly political subjects or not. I am particularly interested in poetry and the act of reading poetry as an act of embodiment. Reading someone else's poetry allows and forces you to occupy someone else's subject position, and I think that this is a pretty important experience. Honestly, I haven't had many occasions working with an outside editor who has asked for revisions or changes to my writing. When I submit work to journals and presses, I tend to get either a yes or no. I don't know why that is. Many of my friends have complained about working with outside editors and about those editors suggesting radical changes to their work. For me, though, there have only been a couple of times when I actually talked through a piece with an editor, and I loved getting feedback on those occasions. Ummm…crack is whack? I don't know. I'm not so good at listening for advice in general. While sometimes it has been difficult, I think that this movement is quite necessary. I like to think of critical prose as an essential part of being a poet. When I first started writing, it was one of the ways in which I could engage in the larger poetic community and conversation. I feel like it is every poet's responsibility to participate in the poetic community in some way other than just sending her work into the world—whether that means writing critical responses to other people's work, or editing a journal, or curating a reading series—I think that it is necessary for poets to contribute to the poetry community, rather than just taking from it. And for me, writing critically about a book really helps me to understand it better than I would if I just read it casually. I try to keep up a writing routine, but it gets pretty hard when I have to demand with the diverse demands of work. So I try to set aside time each morning to write and read and think about whatever my current project is. After a day spent responding to emails and doing administrative duties and reading student work, I find that my brain is pretty shot. So even though I am not naturally a morning person, I've found that those early hours are best for writing. Research—I read deeply and widely until my brain is engaged and then I almost always feel moved to write something. I don't put pressure on myself to write all the time. There is a lot of great writing in the world, but there is a lot of crap, too. I don't imagine that the world will suffer in any way if I am not constantly producing poems. The ocean. My cat (he is a very sweet smelling cat). Certainly— pretty much everything in the world around me influences what I write, whether I intend to find influences there or not. My current project draws from a variety of influences—from Balzac and Kristeva to Young Jeezy and the short lived (and rather bad) tv drama The Gates. The works of Julie Mehretu and Yayoi Kusama have also been very important to my writing/thinking. When I was younger, I used to say that I wished I could have been a dancer in hip hop videos. But now alternative dream jobs look more like being a pastry chef or a wine maker (not that I would likely be any good at those things). I used to be a yoga teacher when I lived in Portland; I really enjoyed teaching yoga classes and was a pretty good teacher, so maybe that is what I would have ended up doing? I've also worked in finance and fashion and spent many years waiting tables, but I can't say that I would really ever want to do those things again. Well, one answer is that I like having an excuse to dwell in language and ideas. I like the solitude and also the possibility to share my world through writing. But I also think that I kind of fell into it—who's to say that with some encouragement in that direction that I wouldn't have become a mathematician or something. I'm probably better at poetry than math, though. Erín Moure's The Unmemntioable and also Pierre Hadot's The Veil of Isis. I'm embarrassed to say that I haven't seen many movies lately—does Mad Men count? I'm also working on some poems that explore the difference/slippage between gentleness and gentility, an essay about Leslie Scalapino's writing in the 80s and how it maps the body in urban space, a couple of book reviews, and an essay about talking too much.